In this series of articles I am discussing the creation of charts and graphs using nothing more than Quartz 2D, a graphics rendering API created by Apple, which is a part of Core Graphics. You might wish to get up to speed with Part 1, Part 2 and Part 3. Our graphs look great, but there are a couple of things missing. First, it is common to have labels that show the scale of values, to number the data points, to provide some comments and so on. Second, with the fabulous touch screen of the iPhone, the users will probably expect to be able to interact with the graph, for example if they tap it, the graph might respond with an appropriate bit of additional information. In this part of the series, let’s see how to enable this kind of interactivity. We’ll leave drawing text on the graph for the final part of the series. Now replace in drawRect all the code that went into the new method with a single line. It should be right next to the line that invokes the method for drawing the line graph. 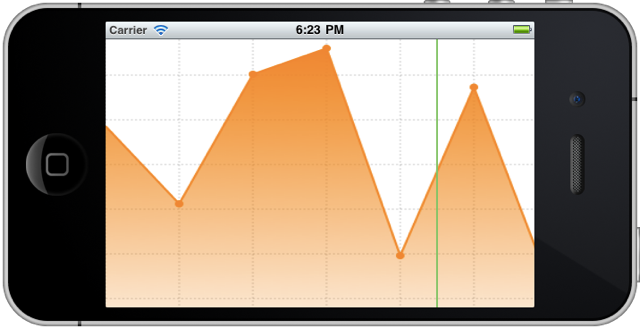 By commenting out one of these lines, we’ll be able to switch easily between different types of graph. We are going to deal with the bar graph first. The idea is that whenever a bar is tapped, a message appears indicating the value of that bar, but if the user taps outside of any bar, nothing will happen. The approach is quite simple. 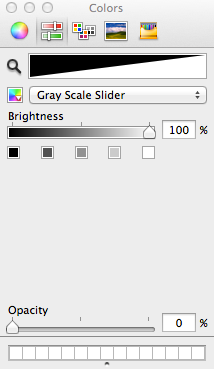 When drawing bars, we create rectangles and fill them with gradients. If we manage to save those rectangles and keep them around, we should be able to test if the coordinates of a touch happen to be inside of one of them. Run the app, tap somewhere inside the graph, and you should see in the log the coordinates of the point that was tapped. Obviously, instead of logging the message that a bar was touched, you can display a view with a label, and set the text of that label to the value of the bar, or do something else that is appropriate for your application. Because that won’t be Quartz 2D specific, I am leaving the detailed implementation to you. What about the line graph then, how should it react to a touch? One possible solution is to draw a vertical line through a data point that is closest to the location of the touch. I don’t think I really need to show how to do that, you know how to draw lines and you can figure out where exactly to draw the pointer. However, when working on such a pointer line, I’ve found an interesting solution, let me show it to you. The first approach that I tried was simply adding code for drawing a vertical line to the end of the drawRect method, and running it after the graph was touched. To make the line visible, I had to request a redraw of the whole graph after each touch. This is where I noticed that the graph became a bit sluggish, redrawing the lines, gradients and labels again and again. Clearly, this wasn’t an acceptable solution. An alternative approach would be to redraw not the whole graph, but only a limited area of it. However, I felt too lazy to do this, and finally found a solution that I believe is simple and nice. The idea is to put another, transparent view on top of the GraphView, let’s call it PointerView, and handle touches and draw the pointer in that view only, leaving the GraphView as it is. Let’s dive into how I did it. 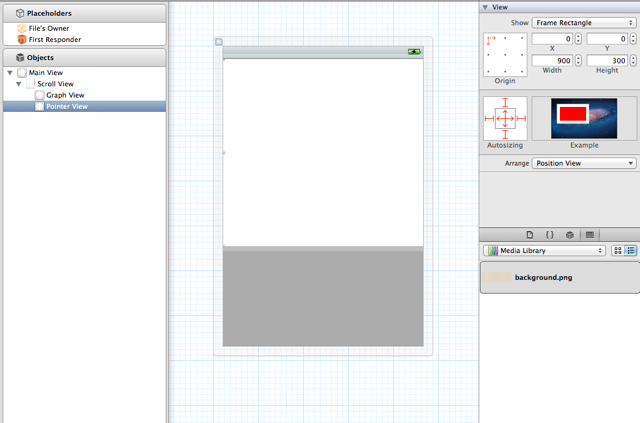 Select MyGraphViewController.xib, then drag a View from the Library and drop it on top of the GraphView. You may need to make some adjustments here. First, make sure that the new View is at the same level of the object hierarchy as the GraphView. To achieve this, drag and drop the new view on top of the Scroll View right in the object tree. Second, set the View’s x and y coordinates to 0. The following screenshot demonstrates what should be the end result of your manipulations. Next, add to your project a new Objective-C class and make it a subclass of UIView. I named it PointerView. Back to the MyGraphViewController.xib, select the newly added View and change its class to PointerView. You might also want to change its name in the object tree to Pointer View. Note that performance won’t suffer, because after a touch we’ll only redraw the pointer line. The only important element that is missing from our graphs now is some textual information. We are going to learn how to draw that text using Quartz 2D in the next, and final part of this series. Stay tuned.